CHICAGO – Two of cable’s sexiest shows return tonight with the season premieres of USA’s “White Collar” and “Covert Affairs,” airing back-to-back at 8pm and 9pm CST, respectively. Whatever one can say critically about these inconsistent programs, it’s impossible to deny the fact that women swoon for Matt Bomer and men drool over Piper Perabo. It’s a two-hour block of beauty and sometimes that’s all you’re looking for after a long day of boring work. Neither “White Collar” nor “Covert Affairs” are the smash hits that USA wishes they would become. They don’t get the numbers of some of the network’s biggest hits like “Burn Notice” and “Suits” and their recent numbers are going in the wrong direction in key demos. But they do get coverage. Matt Bomer ends up on the cover of TV Guide or EW every time the show returns it seems and Piper Perabo is one of the most beautiful women on TV. While the shows may not be breakthrough, they make for good faces for the network. But do they work creatively? Sometimes. I think both shows have moments and elements that elevate them above their peers but they just can’t seem to put them together into a consistently entertaining series. “White Collar” is the better of the two by far but the season premiere of “Covert” actually hints at a show that could be maturing in entertaining ways. We say this a lot about USA shows and it turns out to not be true so I’ll add a qualifier — “White Collar” COULD BE at a turning point. Oftentimes, shows on this network get to the fork in the road where they could become more interesting, daring programs and they revert to familiarity. But something feels different in this season premiere in no small part due to the fact that Caffrey (Bomer) is no longer under government watch. At the end of last season, he jetted off with Mozzie (Willie Garson) in a moment that could have actually been the series finale. Where does “White Collar” go if it’s not in New York and if Caffrey isn’t under the G-man’s thumb? Well, it turns out the government isn’t too happy with Neal and they want him back. Burke (DeKay) discovers that they’re going to track him down and so he tries to do so first to protect him. Meanwhile, Neal & Mozzie are living it up on a beautiful tropical island. Mekhi Phifer guest stars in a multiple episode arc. The switch from high rises to sandy beaches does “White Collar” some good in that the season premiere has a different rhythm (and it helps to bring in a talented TV vet like Phifer). The thing about these shows is how quickly they can get overly familiar and stale. Mixing up the formula even a bit — like taking Neal and Mozzie to the other side of the world — can invigorate a cast and a crew of writers. The premiere is tight — well-written, well-directed, and beautiful to look at. I still think it’s missing some depth but there’s an energy here that’s been sometimes absent from the series. Let’s hope they can keep it up all season. What’s the season premiere about? I can’t really say. It opens with a shocking explosion that can’t be spoiled. From there, I will say that Annie ends up in Marrakech on a mission that’s high on espionage and low on action. However, that’s not a complaint. There’s a nice, slow-burn rhythm here in the premiere as Annie plays sexual games with her target…or is he doing so with her? I liked the tonal consistency here, something that’s been missing in the past. It hints at a show that’s maturing and still willing to change to figure out its strengths. They’re willing to change the relationship between Augie (Christopher Gorham) and Annie or make major cast alterations to develop. Familiarity breeds failure in television nowadays. You have to stay fresh. Or at least hot. “White Collar” stars Matt Bomer, Tom DeKay, Willie Garson, and Tiffani Thiessen. 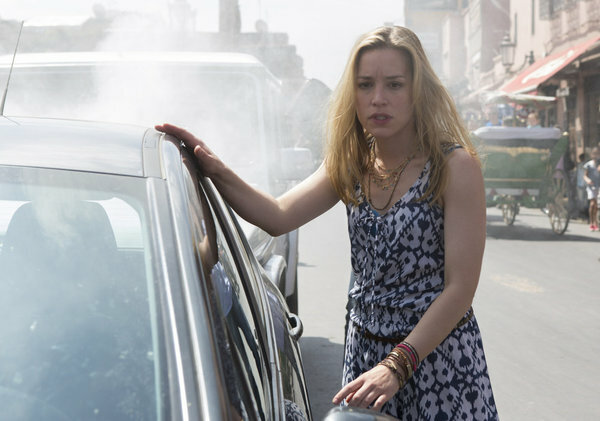 “Covert Affairs” stars Piper Perabo, Christopher Gorham, Kari Matchett, Anne Dudek, Sendhil Ramamurthy, and Peter Gallagher. Both shows return to USA on July 10, 2012. Submitted by Guest (not verified) on July 10, 2012 - 2:59pm. I consistently find your reviews to be so weak Brian Tallerico. You seem to make statements about the shows I like and the actors i like just to get a rise out of people which I have to say you have achieved with this reader. Unfortunately you are one of the few reviewers that covers Covert Affairs so I always end up reading what you say. More fool me. Lay off the show. If you don’t like it stop reviewing it. I for one have finally had enough of your smugness and will stop reading your lame website.